Could the galaxies of the Universe be stalked by rogue, all-devouring black holes? It looks that way. A 2011 simulation of black holes merger revealed that there could be literally hundreds of rogue black holes scattered across the Milky Way galaxy. Each one would weigh several thousand times the mass of the sun, so if these bad guys exist — why haven’t we identified them already? The research modeled "intermediate mass" black holes. There just one problem; no one even knows if these type of light cannibals even exist. Astronomers do, however, have ample evidence that small black holes less than 100 solar masses are produced when giant stars explode. 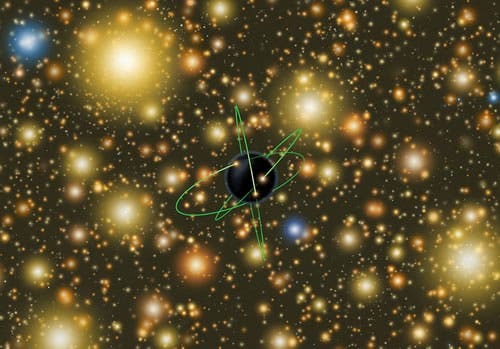 They also have evidence that “super-massive” black holes weighing the equivalent of millions to billions of solar masses sit at the heart of many galaxies, including the Milky Way. Theoreticians have predicted that globular clusters –- ancient, gravitationally bound groups of 100,000 to a million stars –- should contain a third class of black holes, referred to as intermediate mass black holes. But so far there have only been a couple controversial observations of these objects. The existence of intermediate-mass black holes have been proposed as a possible power source for ultra-luminous X ray sources. 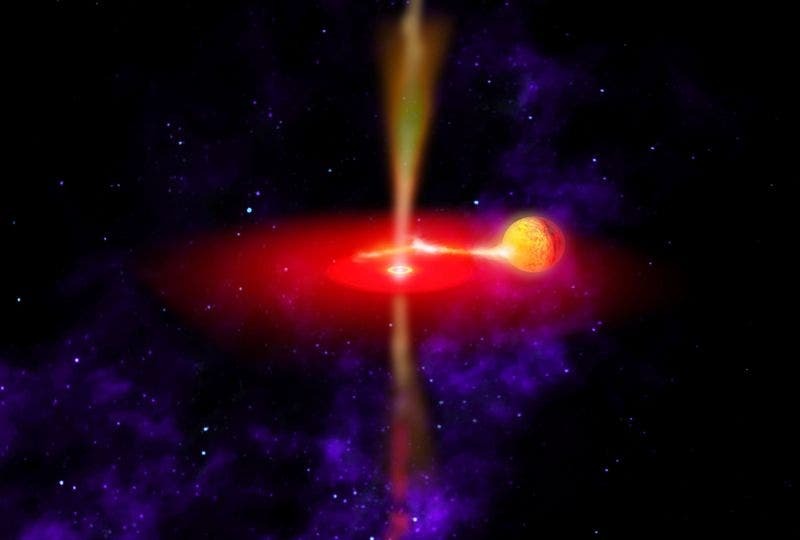 The nature of ultraluminous X-ray (ULX) sources remains controversial, but many astronomers think that some or most of these objects consist of an intermediate-mass black hole that accretes matter from a companion star. Recent evidence suggests that a ULX in the galaxy NGC 5408 shown at top of page has a black hole with about 2,000 solar masses. In the past few years, scientists have succeeded in numerically simulating black hole mergers that incorporate Einstein’s theory of relativity. One of the most intriguing predictions is that when two black holes that are rotating at different speeds or are different sizes combine, the newly merged black hole receives a big kick due to conservation of momentum, pushing it out in random directions at velocities as high as 4,000 kilometers per second. There are about 200 globular clusters in the Milky Way that may have already spawned intermediate-sized black holes, which means that hundreds of them would be wandering invisibly around the Milky Way. These could be engulfing the nebulae, stars and planets that are unfortunate enough to cross their paths, but apparently this poses no imminent danger to Earth – or at least not as far as anyone knows at this point in time. The artist’s concept at the bottom of the page shows an extremely exaggerated-size version of the intermediate-mass black hole that may exist at the center of Omega Centauri. It has the orbital lines of nearby stars drawn in for reference only. Close to the black hole, star motions are faster than those farther away. Such differential velocities are one telltale signature of a black hole’s existence. Most of the clusters stars are cooler stars with a scattering of bluer, hotter stars mixed in. Since supermassive black holes are well known to exist in the cores of galaxies, and stellar-mass black holes are found scattered throughout galaxies, astronomers have long sought to find conditions where black holes with masses between these two extremes could form and evolve. “If one was to find a “minuscule galaxy”, that would be a good place to look for an intermediate-size black hole,” said Noyola.